Spring is a great time to take to the forests and fields to forage for early wild foods. It is especially satisfying if these plants are considered weeds and you forage them from your own garden. Even in the distant past, long before humans developed the written word, winter was a time of hardships and hunger. When the days started to lengthen as the sun traveled back to the north, people emerged from wherever they huddled to take advantage of the first plants to appear each spring. These first plants served a vital purpose by supplying badly needed vitamins and minerals to diets that often consisted of mainly meat for long stretches of time. Even today, with an endless supply of fresh food available in the supermarkets, something must be said for taking to the fields and forests to forage the freshest and wildest food of the season. Many of us take these spring days to clean and weed our flowerbeds and a number of these weeds are edible. Most of these plants are plentiful and easily prepared. Just remember to harvest wild plants in areas where no pesticides have been sprayed and avoid areas where dogs and cats do their business. One of the most common and unfortunately hated plants that can be foraged is the dandelion, (Taraxacum officinale) seen in the header image. Everyone knows what it looks like. Homeowners despise it with a vengeance, however the dandelion serves an important purpose besides being a wonderful food to include in your foraging. The dandelion is one of the first flowers to bloom each spring and it produces large amounts of pollen. This is important to the honeybee population. The pollen isn't wind-borne, so doesn't affect allergy sufferers, but it does provide much needed nutrition to the bees, so remember if you are foraging the flowers, to do so later in the season when other food sources are available to the bees. 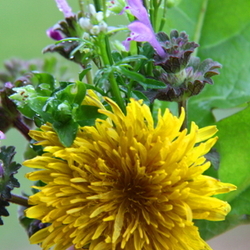 Harvest dandelion leaves by picking them before the flowers emerge. After they start blooming, the leaves turn bitter. Use the leaves as you would young spinach. They can be stir fried, used in salads and make a great pesto. The blooms have all sorts of uses. Dandelion wine is probably the most famous and there are how-to instructions all over the internet on how to brew it. You can also scramble the flowers into eggs, make jelly or just fry them up for a tasty snack. Some say that the fried flowers taste like chicken. For fried dandelion heads, pick the flowers in the morning after they open, picking them close to the head with as little green as possible. Rinse well in a colander under running water to remove insects. Drain and dry well. Sprinkle a tablespoon of vinegar over the blossoms, toss and dip into a beaten egg. Then dredge in a container containing a cup of breadcrumbs (panko is nice) and Italian seasonings, salt and pepper. Heat some olive oil in a skillet and fry the flowers, turning once. Drain on paper towels and enjoy. Dandelions have significant amounts of Vitamin A, Vitamin C, calcium and potassium. Hairy bittercress (Cardamine hirsuta) seen below, is another plant that gardeners hate. It is an early emerging spring mustard and a relative of the more familiar collards and turnip greens. Often called snapweed or shotweed because the mature seed pods fling the seeds far and wide if they are disturbed or touched. It grows everywhere and makes itself right at home in lawns, vegetable gardens, raised beds and containers. It is completely edible so gardeners can take a perverse satisfaction about adding them to the menu. The very earliest leaves to emerge are usually a reddish or burgundy color. That is because of anthocyanin, the substance that gives leaves this color and often it is present before enough chlorophyll is present to display the familiar green shade. There's noting wrong with the plant and those reddish leaves contain antioxidents, go ahead and eat them! 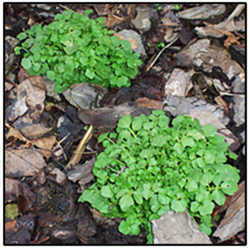 Treat the leaves of hairy bittercress like you would any mustard. If you can use broccoli raab in a recipe, then the hairy bittercress will work too. The leaves have less of a 'bite' if you pick them before the flowers emerge, however some people like the spicy kick. The little white flowers go nicely in salads, so use them too. Bittercress pesto is easy to make and a little goes a long way. Pull 8 to 10 large rosettes of bittercress and slice off the root. Swish in some salty water to clean and dislodge insects. Drain and place in a blender with a clove or two of roasted garlic, a couple tablespoons of high quality olive oil, ¼ cup of grated parmesan cheese, salt and pepper, ½ tsp of sugar and a couple teaspoons of lemon juice. Whirl till everything is chopped and mixed. Add a bit more olive oil if you need to and adjust the seasonings. Use like you would any pesto. It has significant amounts of Vitamin C, magnesium, calcium and beta carotene. Chickweed (Stellaria media) seen below, is another pesky plant that annoys gardeners each spring, most likely originating in Europe, it has spread to every continent on earth. It germinates in the fall, but doesn't have a growth spurt until early spring. It forms large mats of juicy vegetation and invades perennial beds and vegetable gardens wherever the conditions are cool and damp. It is great fresh and can be used like sprouts in sandwiches and salads. Cook chickweed like you would spinach in stir frys and soups. 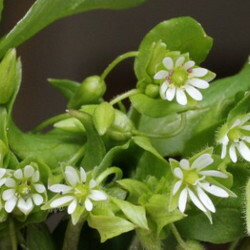 It is high in fiber and Vitamins A, B and C. Chickweed has anti-inflammatory and antibacterial properties. The simplest way to enjoy chickweed is to gather a hefty bunch, wash in salted water to get rid of dirt and insects and drain to dry. While it is draining, fry up a few pieces of bacon till crisp and remove it from the drippings to drain on paper towels. Add some onion (or garlic) and a a couple tablespoons of apple cider vinegar to the pan. Chop the chickweed a bit to break up the bigger stems and add to the drippings. Cook a minute or two until wilted. Crumble the bacon over the greens and serve. People can salt and pepper to taste at the table, however since bacon and drippings are a main ingredient, go lightly with salt until you taste it. These three early spring plants are just a few of what can be foraged for the dinner table this time of year. I chose them because they are plentiful and grow just about everywhere. They do not have any toxic look-a-likes either. Just remember that foraging is healthy only if you know the area and are confident that no pesticides or toxic substances have been used nearby. Get permission from property owners before harvesting and remember that all state and federal lands prohibit harvesting or taking anything away from them, so be respectful. Spring is a wonderful time to enjoy the outdoors and chances are, these plants will be the ones you remove from your flowerbeds as you clean things up for the season. You might as well enjoy them with your dinner!